RUSH: Now, as you people are aware, I have steadfastly — not refused — I’ve just decided not to talk about Comey at all this week, other than some predictions that I made on Monday. And this has been purposeful. I purposely have not talked about Comey for two reasons, actually three. I don’t care. Number two, I made some predictions, and I wanted to see how quickly they would come true. Not “if” they would come true, because I knew that my predictions were correct. And the third reason was, everybody else is and we don’t do what everybody else is doing or does on this program. However, today we are going to be delving into the Comey phenomena, which is exactly the opposite kind of phenomena Comey was expecting to happen. James Comey has not been embraced by the American people. The American people do not care about James Comey in the way James Comey thinks they did or could be made to care or would someday care. James Comey had not established the kind of bond with the American people that would allow him to become the conscience of a country, which is what he thinks he is. You have to earn this connection. They don’t care who he is, where he came from, how he became what he is. 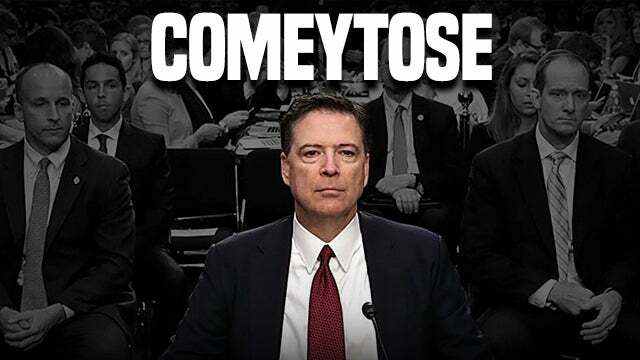 The only thing they care about is there’s something in his book that is gonna take out a president, and if there isn’t, then it’s bye-bye James and hello Comeytose. (paraphrasing) “No, no, no. In fact, I don’t even think I called it the Steele dossier.” I mean, absolutely no sensitivity or even awareness of the pitiful that question posed. And he fell right into the hole that Stephanopoulos — and I don’t even know if Stephanopoulos was digging a hole, frankly. But, for crying out loud, you’ve got this — I don’t want to go through this again, but I was incredulous that the entire reason for all of this he knew was political opposition research and did not tell Trump about it? Which is proof on its face that all of this has been about entrapping Trump. So Comey went out there, did the July 5th press conference, and told everybody, without talking to a prosecutor — it’s not Comey’s decision who gets charged and who gets tried and who doesn’t, but there he is making it. So I just wanted to see, I wanted to see how long it would take for the negative, shall we say, or questionable opinions of Comey to surface. And they did. By the way, another thing reminiscent eerily of Hillary Clinton. His big, august premier book signing was at a top drawer bookstore in Washington. Nobody showed up. The vast majority of people who showed up were journalists, people that had their laptops and their cameras and their microphones and stuff, but nobody showed up. Nobody. I mean, you could count ’em on one hand the numbers of the general public who showed up. Stunning, in Washington. But stop and think; how many average citizens are there in Washington that are going to a bookstore? The point is everybody in Washington works somehow, some way either in the government or someplace that’s tangential to it. And so Comey’s no big deal. Just another government employee that has a book. But nobody showed up. So we’re gonna get into it in due course. Also, Frank Luntz took his focus group operation to ABC News Nightline. And, boy, does Comey get raked over the coals there. Oh, it is huge. I predicted this was gonna backfire. I’m gonna play all my predictions for you so that you will. RUSH: I finally now have arrived at the beginning of the long-promised Comey segment today. I’ve not been talking about it for the past couple days on purpose ’cause I wanted to wait to see if the predictions I made on Monday would come true, or at least we would begin to see signs that I was right. And we’re already seeing the signs. And I want to start by reviewing the various observations and predictions that I made. So let’s go back to last Friday in which I pontificate and predict the impact of his book and that impact on his reputation. RUSH ARCHIVE: He thinks he’s the big guy. He thinks he’s cool. He thinks that he is universally loved and believed — and this, to me, is a setup for a backfire. … I don’t know how much damage it’s gonna do to Trump, but it is gonna cause damage to Comey that I don’t think he foresees. RUSH: That was last Friday. That damage has already begun, and it is plainly viewable, plain to see at the Washington Post, at Vox. All of these liberal media outlets really believed that Comey had the smoking gun, that that was the purpose of the book, that Comey was finally gonna reveal things nobody knows. He was gonna let it all hang out here — and in the process, Comey’s book was gonna nail Trump. And there’s nothing new in Comey’s book. And these people on the left are depressed, deflated. They’re let down, and now they’re lashing out ’cause they don’t like Comey’s smug, better-than-everybody-else attitude. They don’t like him gettin’ down in the gutter where they think Trump is. They don’t like anything about this. But what they really resent is that what they were led to believe that there’s some kind of smoking gun in this book isn’t there. It’s like all the times there has been congressional testimony. Comey was expected to announce a silver bullet during a couple of appearances before congressional committees, and he didn’t — and if he had smoking-gun evidence, that’s where he would have revealed it, because he was under oath and being asked specifically about it and didn’t. So nobody should have thought this book was gonna reveal anything. This book is about manufacturing the image of James Comey as American Superman, conscience of America, the last moral man in Washington. That’s the purpose of this book, an attempt to establish that. RUSH ARCHIVE: I can tell you, folks: After, quote-unquote, “study” today, this thing… I’m already getting Comeytose. It’s just… And you know, this is just the beginning. This guy’s got a month of sales, book signings and tours and TV interviews. You’re gonna be so sick of this guy, and he has miscalculated this like you can’t believe. 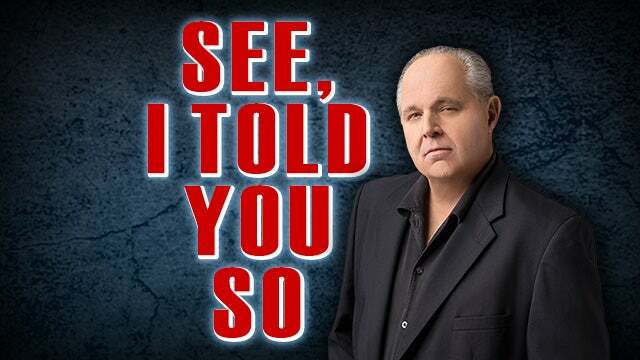 RUSH: And it is a major miscalculation, and it is born… Do not doubt me on this. It is born of Comey — actually, it’s almost McCainitis. Remember 2007, 2006? John McCain was the media darling. The media loved McCain, and he showed up wherever the media wanted, and he gave them what they wanted. When it was time to be critical of George W. Bush, there was McCain answering the call. And that is what happened. I see Comey going through the same stages, believing the media personally loves him, believing all of these people in the country are desperate for James Comey to be the savior of America from these dark times of Donald Trump. James Comey believes this is how he is seen. James Comey believes the American people desperately hope and desperately want him to be what America has always been. And that’s not how the American people see him. That’s not what the American people want out of him. James Comey has not been a public figure interacting with the American people for any length of time whatsoever. He has not earned such lofty status. He hasn’t had the opportunity to build such a bond or connection. He’s been removed. He’s been in an ivory tower, FBI director, he’s the associate FBI director, whatever he is. People have no personal investment in Comey, but he believes that they do. And he believes it because he’s a creature of the media. He eats it up, he absorbs it, like McCain did. And he’s buying it all. He’s thinking that everybody loves him because the media does. Comey’s making the mistake of assuming the media actually is a reflection of the American people. They are not. And I think he’s already in the beginnings of a mental attitude that is, “God. What the hell’s happening to me? This isn’t what was gonna happen. This isn’t what was supposed to happen.” I guarantee you, folks. Being seduced by a wrong and misguided media is one of the most easy things to happen to people, and it’s one of the most dangerous. And that’s what’s happening right now. The Trump supporters were never gonna be invested in Comey, which I think he probably knew. And I saw this. I got here on Monday. 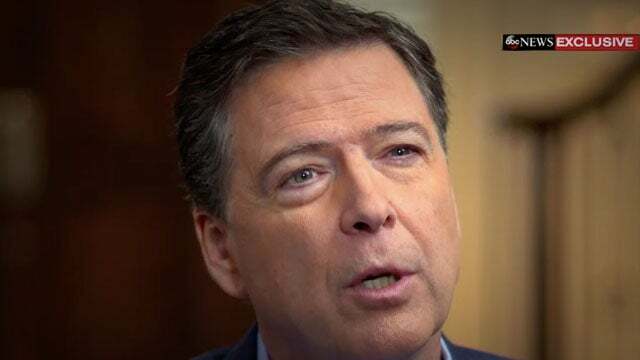 I’m watching TV, part of show prep, and Comey’s doing a new set of interviews after the Sunday night airing of his interview with Stephanopoulos. He’s answering all these bio questions, like, “Yeah, I wanted to be a Superman prosecutor when I was seven,” or whatever the questions were. They were questions nobody is yet interested in about James Comey. As far as the American people are concerned, Comey hasn’t accomplished anything. He’s the FBI director. He’s got an interesting resume. But in terms of doing things that connect with the American people that create a bond, it just hasn’t happened, but yet he’s acting like it has. And it’s all due to the fact, as I say, that he’s misjudging and confusing the media to be representative of the American people. This is what I said on Tuesday at almost the beginning of the program. RUSH ARCHIVE: Comey doesn’t have this kind of a bond with the American people. People are not interested in what made James Comey who he is. People don’t know Comey well enough to care about how he turned out. People are not interested in James Comey in terms of what they can learn about living the good life or the right way. And yet I believe Comey thinks that he has achieved that. I don’t think anybody is really looking to James Comey to learn life lessons. … I’m gonna tell you, that’s not a good place to be, thinking that you’re something you’re not in the eyes of either an audience, or in this case the American people. … The worst mistake you can make as a public figure is to misunderstand how you are seen. People are curious who the guy is, what he’s gonna say, what his book’s gonna do, what’s gonna be the impact of it, but James Comey personally has not yet reached this special status that I think he believes he has achieved. And I think a lot of people make the mistake, because they end up buying or believing the fawning media that they get. Now, I don’t know what the American people think of James Comey, but I do know that it isn’t nearly as lofty as he thinks it is. But I can tell you what they do expect of an FBI director or the all-powerful people in law enforcement. And they expect that stuff not to matter. When you’re pursuing crime or criminals, you don’t decide whether to go after somebody because of what polling data on something says. You don’t decide to exonerate somebody because you think they’re gonna win anyway. You don’t pull back on an investigation because they’re gonna lose anyway. He’s announcing, he’s admitting the politicization of his decisions regarding the investigation into Hillary Clinton. And on this one, folks, again, he opens that October 28th investigation, and he admits it, “because she’s gonna win.” And I’m telling you the real reason that he did that — I’m speculating, but I don’t believe I’m wrong — he did this because he had promised House committees that if any further evidence presented itself, he would reopen the case. Well, way back in August, evidence that Hillary emails were on Huma Abedin and Carlos Danger’s computers surfaced, and he didn’t do anything about it when he found out about it. He waited until October. Now, why wait ’til October? Why wait until 10 days before the election? Answer’s right here: He thought she was gonna win. Therefore, he waited to announce what he had promised Congress he would do, reopen the case if he found new evidence. He waited until he thought it would do the least damage because there wasn’t enough time for Trump to really make much of it. ‘Cause he knew that they were gonna announce, in another three days, that they didn’t find anything. So he was gonna end up with a two- to three-day investigation at the conclusion of which he was gonna once again proclaim her innocent and unprosecutable. And the real reason for doing this — do not doubt me — was to see to it that after she was elected, which he was certain was gonna happen, she was untainted, that there would be no reason for further investigation of Hillary Clinton. This was done to send her off scot-free with no legal encumberments whatsoever after she had won. It was to clear the decks for her. Now, the Democrats think it all backfired and Comey is trying to salve their anger, “Well, I may have been doing the wrong thing. Maybe I should have done something else,” blah, blah, blah, blah. RUSH: We have focus group audio from last night’s ABC News Nightline. Frank Luntz gathered his collection of focus groupers and convened for a broadcast of Nightline. 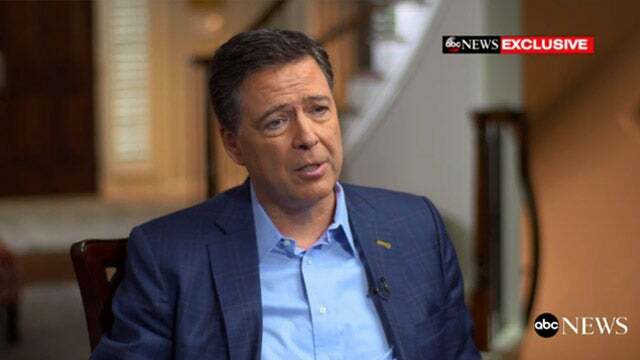 It was to watch Stephanopoulos’ interview of Comey and have the focus groupers react to what they saw and what they thought about it and what they felt about it. This focus group savages Comey. They call him weak. They call him pathetic. They call him a moron. UNIDENTIFIED WOMAN 1: (echo) When I thought he lost credibility is when he said he didn’t know where he was during the election. UNIDENTIFIED WOMAN 2: You know, “I don’t… I don’t remember,” and “No, I didn’t vote.” I thought he looked like a complete moron. WHIT JOHNSON: What surprised you about tonight? FRANK LUNTZ: Probably his weakest moment was when he didn’t know where he was on election night. That they thought that some of the things that he couldn’t answer, as FBI director, he should have been able to answer. RUSH: He didn’t know where he was on election night. (laughing) He didn’t know where he was on election night! Do you know where you were the first time you heard this program? Everybody knows that. Everybody can tell you where they were when they first heard this program — and if you think back to last election night, you know where you were. Comey doesn’t know where he was? That means he doesn’t want to tell anybody where he was, folks. Here’s the next bite. By the way, the voice you hear in the setup here is an ABC reporter named Whit Johnson. Luntz’s voice is also in these bites. UNIDENTIFIED MAN 1: He’s making personal attacks against his appearance. He hasn’t said anything relevant substantively that questions his leadership ability. UNIDENTIFIED MAN 2: I hate to say this, but I have to agree with him. The little pettiness stuff, he needs to get rid of that. WHIT JOHNSON: (to Luntz) When Comey talked about the president’s appearance, did that hurt his credibility? RUSH: Well, there are exceptions to that. When you’re talking about Fresno State professor — the fat professor with the tattoos — who was happy that Barbara Bush died, I mean, it’s okay to reference her appearance because it’s probably one of the reasons she’s so mad. But the point is, generally Luntz is right. Talking about people’s appearance is not gonna get you anywhere, because most people… If you get down to it, most people are not happy with how they look. Even Top 10 models! You would not believe it. Sometimes it gets manic how unhappy with themselves they are. You know, you look in the mirror, you see your flaws, but you think you’re the only one that does that. You think nobody else does. You think everybody’s got their stuff together. They’re hip. Everybody thinks there’s something wrong with them, and that’s why you’re not supposed to do it. Plus, it’s just good manners. But look, Comey decided to go there. Why did Comey go there? I think because he’s a copycat. He’s mimicking. You know, it’s Marco Rubio that made fun of Trump’s small hands in the debate. Rubio had to end up apologizing. But Comey thinks that the audience for this book is deranged leftists who used to hate him. Last October and then on to Election Day, these people hated him. But since Trump has won and since Comey’s role in getting Trump has become known, some of those people have turned around and loved Trump. So Comey’s assessing his potential audience. He reads social media. He looks at all these base, guttural insults of Trump that he thinks potential buyers of his book are making and so he thinks the way to relate to them is to do the same thing. There’s no question in my mind this is what he’s doing. Comey has no experience relating to the American people because he’s never had to do it! The government jobs he has had have all featured jobs that have power over the American people, law-and-order power over people. It’s been of no practical interest to James Comey what people think. In James Comey’s world of law and order, most people, most perps lie. Everybody says they didn’t do it. I will guarantee you… I know this guy. I know this guy just as well as I know Trump on the other side of this equation. I’m telling you. He’s out there; he’s sitting on what he thinks is a gold mine with this book. By “gold mine,” I mean he’s sitting on a huge, big payday. And these publishers — these liberal, left-wing New York publishers — constantly misread the American public because they, A, make fun of and laugh at conservatives and really don’t even want them buying their books. But like CNN and like Obama decided, “I don’t need any white, working class voters. I’ll aim everything I’ve got at the American minorities.” Well, these publishers are doing the same thing. They’re literally discarding, statistically, half of the American public as purchasers. It’s stupid! It’s stupid PR; it’s stupid marketing. But this is what the politicization of all this stuff does to things. It warps you, and it creates enemies. These publishers ought to be interested in selling books, period! They should want everybody to be interested in whatever they publish and buy it. Now, granted, they have niche authors and niche targets and so forth. But this is nationwide. This is supposed to be a U.S. national best-seller. And the way they’re marketing it and the way Comey’s out there talking about it, they’re cutting off half the audience. Now, of the half of the audience they think might buy it, some of them used to hate Comey back in October-November of last year. So Comey thinks the way to relate to ’em, the way to get them on his side is to talk about Trump the way they do, the way he hears they do. So he probably looks at Twitter and looks at some of the trolling. He looks at some of the insults, and he figures that he can convince people to buy the book by convincing them he’s one of them, by getting down in these guttural little insults about orange faces, ties that are too long, small hands. It’s a total, total miscalculation — and here you have the Luntz focus group plainly indicating this. Here is the last sound bite from the focus group of Nightline last night. WHIT JOHNSON: Shockingly there was one statement Comey made that everyone ultimately agreed with. FRANK LUNTZ: (on camera) Does anyone want Donald Trump impeached here? ALL: No. No. No. No. UNIDENTIFIED MAN 1: It’s very, very damaging to the country. UNIDENTIFIED MAN 2: I thought this was an extremely eye-opening experience. I just found him to be a very weak, pathetic personality. I found him to be extremely two-faced. RUSH: That’s a focus grouper talking about Comey. Now, how many people do you think in a strictly left-wing focus group or group of people would tell you, “No, I don’t think Trump should be impeached”? None. They all want Trump impeached starting with Democrat members of Congress led by Adam Schiff. They all want him impeached. And yet here’s Luntz trying to put together a focus group, which is a cross section of the American people to get the most accurate response, and he can’t find anybody that thinks Trump should be impeached. I will guarantee you, I will guarantee you that the people behind the Comey book and the people behind U.S. Democrats in Congress and so forth. all he believe the country is clamoring for Trump to be impeached. Very teachable moment here, all of this. RUSH: We have Mike in Clearwater, Florida. Glad you called, sir. It’s your turn. Hello. CALLER: Rush, thanks for having me today. I’m a CPA who’s taking a little time after tax season to enjoy your show. Thank you for all the hard work you’re doing. Rush, us hardworking Americans, right-minded thinkers, we’re not buying this from James Comey. We’re not buying his moral corruption, his dereliction of duty. He’s corrupt ethically and professionally. Let’s go back to October 28th. They were betting the house that they were gonna get away with it. They were betting the house that they were gonna be able to walk on and keep going and not look in the rearview mirror, and if Trump didn’t get elected, what would have happened? And I’m so glad we’re in this place we are now. What are they gonna do if he brokers a deal with North Korea and receives, if it’s even possible, the Nobel Peace Prize, which he will more deservedly deserve than Obama back in 2009. Let’s just start there. RUSH: Well, okay. If you want to start there, I can safely assure you that Donald Trump will never win a Nobel Peace Prize for anything unless they invent one for what they call boorishness and stupidity. But he’s not gonna win the Nobel Peace Prize. There’s a bunch of commie babes at the Nobel committee. There’s no way. If he could make peace with North Korea, he could have the ChiComs announce they’re going capitalism, Vladimir Putin could stop everything and throw Trump a party, there’s nothing. He will never get a peace prize. RUSH: Especially if it’s deserved! Especially. I mean, Obama, a peace prize on the come? Obama’s been in office for 60 days and they give him a peace prize? Obama put us in more wars than we had been in in 20 years. And they didn’t even rescind it. CALLER: When do polls dictate the policy of our judicial branch? When did this start occurring? Because again, the transparency that’s occurred since the president’s got elected, is this going to, through these requests to Sessions, are we gonna get some resolution out of this? Do you feel that they will actually have committees and charges brought against Comey and some of his other underlings? RUSH: I actually don’t think that is ever going to happen. I’m not saying it shouldn’t. I just don’t think that the swamp is going to turn on itself. For something like that to happen, you’d have to have a Trump attorney general who is of the mind to do this like you’re describing. The swamp traditionally protects people. The left in general protects. They circle the wagons around people, just like Hillary is never gonna be tried. And I’ll tell you what, even if she is, do you know that Comey has made it impossible to convict her? I mean, you better come to grips with this, folks. James Comey has made it practically impossible to convict her. And he did it in his July 5th press conference where he totally exonerated her. He listed the things that she did and then he said, “No reasonable prosecutor would ever bring charges.” And he did this without even consulting a prosecutor. He did this without talking to the attorney general or any of the United States attorneys. He took it upon himself because he said that Loretta Lynch was lying to him and Loretta Lynch had compromised herself by meeting with Clinton. So this guy decided, as the FBI director, to take it upon himself to become the chief prosecutor in the Department of Justice. And he announced, after detailing what she did, that she didn’t intend to do it and that no prosecutor would ever, ever bring charges in anything like this, even though prosecutors have. He’d be the star witness for Hillary Clinton because of what he’s already — he’s already prejudged the case, he’s tainted any jury that would be seated. She’s not gonna be prosecuted. And in the case of Comey, I don’t know about prosecution, but this book of his, he’s writing a 300-page book detailing an ongoing and not ending any time soon investigation. He’s violating reams of standard practices here, in every page of this book. Now, I don’t know what the legal remedy is. But I just myself, I don’t see it. I would love to be wrong. And I’m not of my opinion because I don’t think that it’s prosecutable. I just don’t see — the swamp doesn’t do this. And the swamp is still anti-Never Trump. The deep state, whatever you want to call it, there’s still a whole lot of career people — CIA, DIA, NSA, FBI, DOJ. Now, I happen to be relatively confident that there are a lot of people in the FBI that are not happy with what is being done to the reputation of the agency because of Comey politicizing it the way he has. You’re gonna have to prosecute Sally Yates, you’re gonna have to prosecute McCabe, all these people. I don’t see it, under the premise that we can’t afford this. It would rock the country. This would turn the country upside down. This would cause people to lose confidence in everything, and we can’t afford for this to happen. Make side deals, these guys accept some kind of punishment. But look. I mentioned Sally Yates for a reason. We’re not through learning about efforts she made to totally gum up the Trump administration after it was inaugurated. Look at it this way, folks. James Comey did not want to taint Hillary Clinton’s election victory, so he reopened the investigation into her emails in late October, exonerated her again two days later. This was designed to get her elected free and clear with no legal encumberments or dark clouds. It is the same reason they never really accused the Russians of tampering with the election before the election. They didn’t want that to taint her election. They didn’t want any discussion that Hillary won because Trump got screwed by the Russians. So this whole idea that the Russians tampered, that didn’t gain any full-fledged steam until Hillary lost. They never talked about this. I mean, there were stories of the Russians meddling, but it was to do with the Podesta emails being released to WikiLeaks. But in terms of tampering with the election, no, no, no, no, Russians, no, no, no, no. There was nothing that was gonna taint Hillary’s election. Pure and simple. Also Karen Tumulty writing at the Washington Post: “Donald Trump is Contagious. He turned James Comey into Donald Trump.” That’s the headline of her column about Comey’s book. Karen Tumulty, card-carrying leftist media member extraordinaire, says Comey’s pettiness, insecurity, and need for affirmation plus an ego that stays in high gear has totally, totally clouded the work. 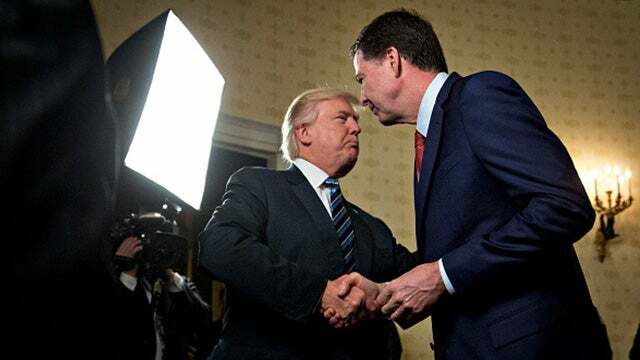 I told you that Chris Wallace, Fox News, called Comey’s book “bitchy.” Bill Clinton pollster Mark Penn wrote a column at TheHill.com, and he focused on the big deal to me, which is Comey not telling Trump that the Steele dossier was Clinton opposition research. You know, folks, I really can’t get over that. That is, to me, everything in a nutshell. Because if Comey had admitted to Trump that that whole dossier was Clinton opposition research, that would have shut down the investigation. Can you imagine Trump going on TV and saying, “Hey, the FBI director just told me that this whole dossier was bought and paid for by Hillary Clinton. That it’s an effort to impugn me, and it’s not true!” It would have shut down the investigation. The FISA warrants were based on it. The entire media campaign and all of the leaks from the deep state about it were rooted around the Steele dossier, golden showers story. If Comey had admitted to Trump that this thing was Hillary’s work product, it would have ended everything, totally ended investigation. It might not have on the spot, but it would have taken the wind out of all the sails. If the thing everybody’s relying on is fake, the result of Clinton and DNC opposition research — That’s why, folks, I keep saying this is one of the biggest political scams that we have endured in our lifetimes. This whole thing is manufactured, and the fact that it’s still alive and kicking is a testament to just how solidly aligned everybody in the pro-Hillary camp and the anti-Trump camp is, ’cause this is a giant, giant hoax. RUSH: Adrian, Michigan. Hank, I’m glad you called, sir. Your turn. Make it count. CALLER: Yes. So happy to talk to you. Mega dittos. I’ve been trying to reach you since the mid-eighties, actually. (chuckling) I just have a good theory, a pretty good theory of why Comey didn’t tell President-Elect Trump where the dossier came from or who paid for it. He was providing a warning from him and the other intel chiefs in the room who moved away to allow Comey to deliver the warning that the intel community is all powerful and can screw you “seven (sic) ways to Sunday.” That quote, if you don’t recognize it, came from Senator Schumer as a warning to Trump a few months later, which says that Senator Schumer recognizes the corruption and acknowledges it and accepts it. That’s the problem we have in this country. RUSH: Well, that’s a good point. That’s right. Schumer did warn Trump these guys can get you seven different ways from Sunday or whatever, acknowledging that it exists. Now, Comey mentioned to Trump about the dossier twice, once on January 6th and once on the 27th. You know, Trump was president on the 27th. The first time it was mentioned, Trump was president-elect. Now it could well be that Comey was trying to warn Trump, although about what, I don’t know. What does that kind of guy look like, anyway? RUSH: Lanny Davis thinks that Obama should have fired Comey. He said that on Fox News last night. Comey should have been fired because he openly talked about the Clinton email investigation without charging her and weighed in on it within 60 days of the election. He accused Comey of only thinking about himself. Lanny doesn’t get that Comey was trying to protect Hillary. Lanny thinks that Comey destroyed Hillary, and there is that school of thought. But, anyway, it’s just another leftist that’s not buying into Comey. Comey is saying he doesn’t think Trump will fire Mueller. The Senate is trying to come up with legislation to protect Mueller from being fired. Mitch McConnell thwarted that. Now the Senate’s trying to thwart McConnell. Did you hear what little Pencil Neck did in — you didn’t hear about this? Adam Schiff has proposed legislation that would say President Trump can’t pardon anybody in order to prevent them from being investigated or convicted. Look, he’s doing it only for his stupid constituents to celebrate him and applaud him. It’s totally unconstitutional. His bill will never even be written up much less be marked up and sent to the floor. But everyone else is out there trying to restrict what Trump’s pardon power can do. And the attorney general of New York is trying to overturn a New York law that would allow New York to prosecute people that Trump pardons, if there are state violations involved with what the perp did. President can only pardon people for federal violations. The left is, they don’t care about the Constitution and they’re genuinely — they’re nuts. I mean, they’re genuinely nuts.